The local Mayor opened our 80s themed Fun Fair at Tesco Extra, The Link Way, St Helens. Running from Thursday 25th to Sunday 28th April, the fair with over 25 attractions is helping to raise funds for Diabetes UK – with a target of £5,000. preEaster presentation at Bolton Wanderers Football Club’s Reebok Stadium in Horwich. One offer was three free tickets on every five tickets purchased, whilst another promotion was the Day Saver offer which included the purchase of eight tickets for £10, 16 tickets for £20 and 24 tickets for £30, with each individual ticket costing £2 each. There was also the chance of a free Easter egg for the first 50 children under 12 to purchase five ride tickets each day for the duration of the fair. Fifty pence off vouchers were given out with a purchase of a candy floss or a giant hot dog and an added attraction for the children was to have their photograph taken on the rides with Micky & Minnie Mouse and Fred the Monkey. All the tickets could be purchased from the ticket box office at the entrance to the fair and all rides were one ticket except for the Booster which was two tickets. At the entrance were the 1955 Scammell Explorer and Bolton Fairground Organ from the Kurt Hill vintage collection. There were also plenty of advertising banners promoting all the offers available at the event, along with the firm’s recent new advertising ‘A’ framed trailer. The fair was built up on the overflow car park across the main dual carriageway from the main car parks at the Reebok Stadium and was next to the Bolton Arena Sports Complex. The fair had the potential to attract many visitors from motorists passing by the side of the ground on their way to the very busy Middlebrook retail park which is home to many large stores, multiplex entertainment centre and food outlets. There was a good selection of rides and attractions for all to enjoy and one not normally found at a North West Funfairs ground was the Bomber Booster of Elliot Cubbins, which provided an ideal beacon for the fair to the nearby M61 motorway. The usual stable of rides from the lessees were again in attendance which included their No l set of Dodgems, Supreme Waltzer, Miami Trip Miami, Christer Twist, Skydiver Paratrooper, mini Ski Jump, mini Paratrooper, lady bugs, mini super jets, Camelot bouncy castle, inflatable slide, Ye Olde Traditional Striker and two catering kiosks. New from North West Funfairs and making a debut at its first fair was the Sweety Treaty sweets kiosk with all tubs of sweets just £1 each. The kiosk has yet to be decorated but will be done to the normal excellent standard of decor of their other equipment. Also on the ground were two ‘baby’ strikers which stood either side traditional striker, for girls and the for boys. Other attractions here consisted of David Hackett’s Acrobat and bi-planes; Craig Harrison’s Ghost Train; Laurence Hill’s Superheroes of the main a pink one other blue Fun House; Michael James Hill’s toy set, teacups and grabbers; Dean Hill’s mini train and hook a duck round stall; Raymond Holland Jnr’s Flying Circus jumbos and mini chairs n horses; and completing the line up was Robert Hill’s bungee trampolines. Henry Hill told World’s Fair that they had been very happy with the amount of business the fair had received. Henry explained that the firm’s promotions seemed to be successful because their approach was ‘what you see is what you get’ with no gimmicks, just all the fun of the fair from a traditional fun fair. The official opening of the event was at 4pm on March 30, following which the fair opened each day from 12 noon until 10pm, running until April 3. Would you like to promote your business or non-fairground event with one of the largest travelling outdoor fun parks/funfair in the North West? We can supply any promotions for any event? We will design, print and distribute posters/leaflets advertising any event or business etc on your behalf. Or if you would like to sponsor any of our forthcoming events. CALL US NOW IF YOU WOULD LIKE US TO PROMOTE YOURS TOO ! We supply to the following towns and cities such as Bolton, Salford, Manchester, Liverpool, Runcorn, Bury, Rochdale, Leigh, Wigan, Chester, The Wirral, Warrington, Southport, Blackpool and too many more to mention. If you would like your business promoted in any of these areas please don’t hesitate to contact us today! North West Funfairs have been successful in presenting several brand new fairs this season, the first two being at the new Salford City Rugby Club Stadium (to celebrate the opening) and a new Valentine’s Fair at Prescott near Liverpool, A third new event took place at Walkden and a fourth new ground was lined up for Belle Vue on the site of the famous amusement park. The fair at Walkden took place on the Ellesmere Retail Park on Bolton Road not far from the town centre and ran from Wednesday 22 – Monday February 27. It is almost eight years since a fair last took place in the town. As at most North West Funfairs events, there are special promotions to entice the public and here it was to buy any five ride tickets for £10 and receive three tickets free. The price of single tickets was £2 each and these could be purchased from the on-site ticket box office. There was an excellent and varied selection of major rides and supporting attract ions on the ground and from the lessee caine their Miami, Supreme Waltzer, Christer Twist, Skyrider Paratrooper, mini Ski Jump, mini jets, mini Paratrooper, Camelot bouncy castle, inflatable slide and catering kiosk. Alongside these were William Roberts’ Megabounce Jump n Smile which proved to be a popular ride, and Music Tagada; David Hackett Jnr’s Ski Jump; David Hackett’s Acrobat and bi-planes juvenile; James Holland’s Crazy Cage Meteorite; Laurence Hill’s Superheroes Fun House; Craig Harrison’s Ghost Train; Robert Hill’s Spiderman bungee trampolines; Whitney Hill’s toy train; Michael James Hill’s teacups, toy set and cranes; Dean Hill’s mini Waltzer and hook a duck round stall and Michael Hill’s ring over bottles arid hook a duck stalls. At the entrance to the fair stood the firm’s new A framed promotional trailer. This also has space for an advertisement board for advertising either the present fair or a forthcoming event. Henry Hill told World’s Fair that the event had been very successful and they had been very happy with the amount of publicity the fair had received. He explained that the catchment area around Walkden had been a factor in its success, along with the fact that nearby Farnworth no longer had a travelling fair visiting the town, which may have helped bring in visitors from that area who missed their fair. Following hot on the heels of their Family Funday presentation in support of the opening of Salford RedsRugby League Club’s new stadium, North West Funfairs presented a new Valentine’s fair in Prescot, Merseyside. The location for this new venture was the Manchester Business Park, close to Prescot Station. Over previous years the firm has tried a number of locations for its Valentine’s fairs including Widnes, Oldham and Bolton, but this was the first time in Merseyside and the firm hope to try their luck in the area again in the future. The fair opened on February 10 and was set to run until February 19, opening between lpm-lOpm daily. World’s Fair visited on the first Saturday when we were informed that the fair had enjoyed a good start with plenty of people coming and going, despite it being bitterly cold. Standing proud at the entrance to the ground was Kurt Hill’s Scammell Explorer, on this occasion accompanied by the firm’s new A frame advertising trailer, which features the slogan ‘It’s All The Fun of the Fair as seen on TV’, painted in a traditional style using gold and red as the main colours, set on a black background. The slogan played on the role of the fairground industry in the recent Channel 5 documentary series Fairground Attraction. Giving the fair some aerial presence was the Bomber Booster of Elliot Cubbins, which for the last few years was a regular at the Leeds Valentine’s Fair when in the previous ownership of C&SA Leisure. Amongst the offers and promotions available was a children’s unlimited ride wristband which allowed children under the age of ten to ride 11 attractions for £9.99. Other offers included five tickets for £10, with three free tickets thrown in for the bargain. With the exception of the Bomber which was on two tickets, all the remaining attractions were one ticket each. Tickets could be purchased from the firm’s box office, which was situated just inside the gates of the ground. North West Funfairs brought along their mobile One Big Weekend stage, which is a regular at their many events of this style and was set to play host to daily shows from Captain Custard and special guests Micky & Minnie Mouse. Looking at the fair itself North West Funfairs brought along their Supreme Waltzer, Christers Twist, Miami and Skyrider lifting Paratrooper by way of machines and these were supported by rides that are not normally found open with the firm. These included the Music Tagada of William Roberts, the Ski Jump Coaster and Acrobat of David James Hackett, and James Holland’s Round Up. Supporting shows were Craig Harrison’s Ghost Train and Lawrence Hill’s Superheroes Fun House. Children’s rides came from North West Funfairs with their mini Trooper, Lady Bugs, trad itional Swingboats, bouncy castle, inflatable slide and mini Ski Jump along with Robert Hill’s bungee trampolines; Witney Hill’s Safari train; Michael James Hill’s toy set and cups; and David James Hackett’s bi-planes. Craig Harrison’s new and as yet undecorated hook a duck was one of the games on offer, with a second hook a duck from Michael Hill who also presented a darts stall and cranes. Catering came from Northwest Funfairs. Bolton’s Big Weekend got off to a flying start with appearances from Hollyoaks actor Darren Langford and the girls from A-Jay’s Morris dancing troupe. The four-day event at Leverhulme Park is set to attract thousands of visitors, with attractions including rides, a dog display, a mobile farm, a bird of prey show, stunt bikes, Titan the robot, a vintage vehicle show, a craft marquee, a talent show, entertainers and firework displays. Organiser Henry Hill added: “It’s in its third year and is getting bigger. We had 20,000 people last year and we’re expecting even more this year. Katie Nash, aged seven, from Darcy Lever, was one of the first people through the gates yesterday. Also taking a starring role over the weekend will be a young busker, who was invited to appear after show organisers spotted her talent while she was singing in Farnworth town centre. Krisshan Jade Weedall has more than 400 followers on Facebook after she started busking in Market Street last September. The 12-year-old, from Farnworth, said: “I’m excited about it, because it’s nice to be asked to open a show. “My mum’s happy about it. She says she’s very proud.” Krisshan will start the show on Saturday and Sunday at noon. She will be singing pop tunes by artists such as Whitney Houston, Bruno Mars and Adele. Entrance to the event is by wristband, costing £2, which can be purchased on the gate. The show runs from 12pm until 9.3Opm today and tomorrow, then from noon until 7.3Opm on Sunday. Bolton’s annual summer funfair is under way. And lots of people have already been enjoying the rides at the fairground site off Black Horse Street in the town centre. The Mayor if Bolton, Cllr Noel Spencer, officially opened the site along with mascots Fun and Fair. It is open every day from 1pm to 8pm until August 14. Southport’s One Big Weekend show presented by North _ West Fun Fairs took place at the Leisure Lakes site, Mere Brow, Tarlton over the bank holiday weekend. Leisure Lakes is a caravan park with some 110 pitches and offers its guests a wide range of activities from paint balling to archery. This was the second event by the firm following on from last year’s first Big Weekend event at Leverhulme Park in Bolton. Two months of planning have gone into putting on the show, with further events scheduled for later in the season across the North West. North West Fun Fairs must be commended for putting a show on in the true sense of the word and it is hoped they can take the whole package to other towns and plug some gaps made in the area’s dwindling show calendar. The weekend’s events kicked off with a fun fair and firework display on the Friday evening. On Saturday, gates opened at 10am with a full timetable of arena events scheduled between 1pm and 6.30pm. Arena acts included the Big Foot monster truck, a motorbike stunt display team, a tug of war competition, a children’s TV character ‘meet and greet’ and on the Bank Holiday Monday, a birds of prey aerial display. Besides these displays, the stages played host to numerous acts from Rod Stewart to Elvis sound-alikes, a talent contest which brought acts from as far away as Bolton and The Wirral, whilst on the Saturday there were vintage vehicles on show. Elsewhere on the show field could be found market stalls, craft marquees, food courts and a beer tent. Each day was scheduled to be rounded off with a firework display. Meeting visitors at lunchtime on the Saturday was Emmerdale’s Mark Charnock who plays the programme’s Marlon Dingle. World’s Fair visited late on Sunday at around tea time, when visitor numbers possibly reflected the time of the day. We were informed that this had been the busiest day, although the two previous days had been somewhat affected by the weather. Entry to the show was set at £3 for adults, £2 for kids . and OAPs, with free entry to babies and prams. Visitors were also given the chance to win a mountain bike in a free prize draw on entry to the ground. Greeting people at the entrance was a new purpose built paybox constructed for the shows by Kurt Hill. This was not the only piece of Kurt’s handy work as close by inside the ground was the second example of his work in the shape of a traditional striker. This was built originally for the Editor of Cheshire Life for a photo shoot. Also greeting visitors either side of the entrance was and Ski Jump; Michael Hill’s Dodgems, dome, toy set, teacups and cranes; James Bedford’s Ski Jump, toy set, Chairs and Little Wheel; Robert Hill’s penalty; Bradley Wright’s Rotor; and stalls from Michael and Dean Hill. Catering was by North West Funfairs and Willow Catering on the show field. the firm’s Scammell Pioneer and the firm’s McCarthy 54 Key organ. There were fewer machines present than at Bolton, with the majority coming from North West Funfair Supplies and these included their Supreme Waltzer, Christers Twist, Skyrider, Miami, inflatables, Chairs, jets, ladybirds and Ski Jump; Michael Hill’s Dodgems, dome, toy set, teacups and cranes; James Bedford’s Ski Jump, toy set, Chairs and Little Wheel; Robert Hill’s penalty; Bradley Wright’s Rotor; and stalls from Michael and Dean Hill. 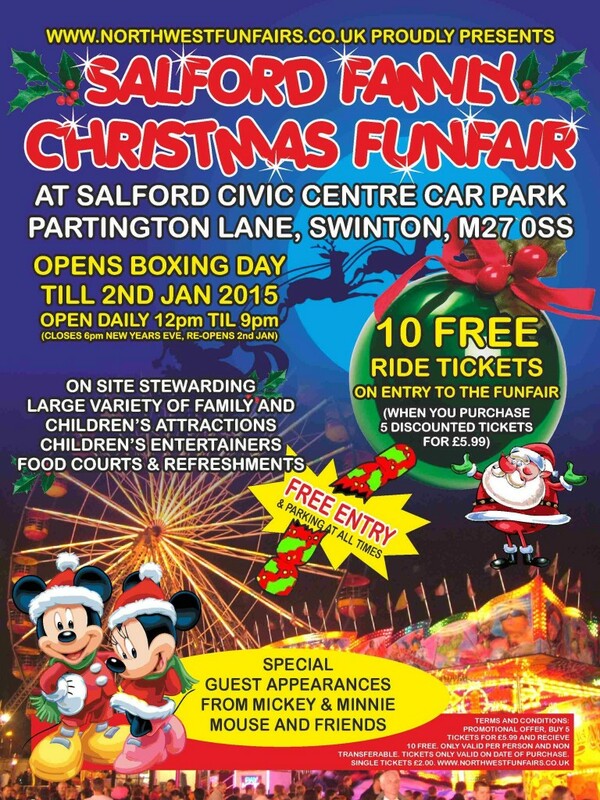 Catering was by North West Funfairs and Willow Catering on the show field.